We are open today. Please call the shop prior to driving downtown to make sure we are still open due to the icy conditions. Elegant Quilts, Country Charm Book and Freezer Paper. 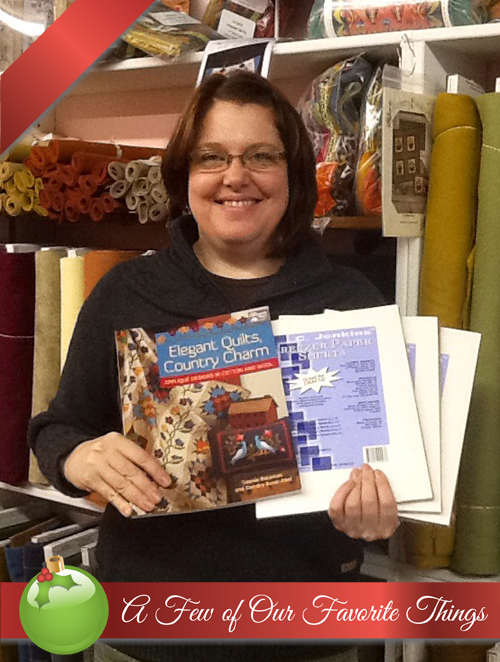 Elegant Quilts, Country Charm Book regularly priced $26.99, today $16.49. Freezer Paper regularly priced $9.49, today $5.49. Elegant Quilts, Country Charm Book: Experience the joys of using wool applique to add depth and texture to your quilts & other projects. There are no edges to turn under and wool doesn't fray! Even beginners can create these cozy, antique-looking quilts. Choose from 11 traditional projects. Freezer Paper: It has a special coating to enhance the adhesiveness to fabrics with very low heat from any household iron. It is over twice the weight of standard freezer paper to prevent rolling and curling in printers.